On the basis of the team's pre-season preparation, including 11 unofficial games in Florida over spring break, and anchored by returning players from last year's 19-9 season, the squad looks strong and ready for a competitive spring. Pitching ace Emma Corbett '16 returns to the circle and some powerful hitters and capable fielders, including Maddy Bedrock '17, Grace Beveridge '18 and Claire Chestnutt '18, rejoin the roster as well. The team also looks forward to significant contributions from new sophomore Danielle Towle, both in the field and at the plate. 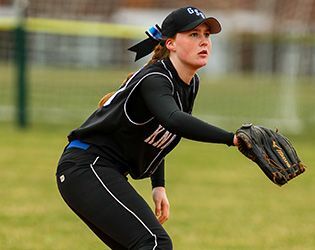 Seniors Sam Delehanty and Kaitlyn Moriarity will be expected to take charge of the outfield, while the team's ten junior and sophomore players will add depth to the lineup, contributing on the field and in the box. In addition, the team welcomes three freshman to the roster this season and looks forward to their contributions as the season unfolds. Looking ahead, big matchups will include Morristown Beard, Pingry, Montclair Kimberley and Bound Brook. The Knights are looking for a repeat Prep B Championship title and will be working to reach the finals of the state; last year the team fell short in a 5-4 semi-final loss to Mater Dei. The season opened with an 8-4 win over Mount St. Mary's on Tuesday April 5. Senior ace Corbett led the team with 17 strikeouts. Softball roster: Emma Corbett '16, Samantha Delehanty '16, Kaitlyn Moriarty '16, Madeline Bedrock '17 Carolyn Brand '17, Genevieve Fischer '17, Emily Supron '17, Grace Beveridge '18, Claire Chestnutt '18, Alexandria Delehanty '18, Nour Marzouk '18, Josephine (J.J.) Neville '18, Danielle Towle '18, Ilana Druskin '19, Carolyn Herrlin '19 and Brooke Starr '19.